Built by Fred Lebensold. 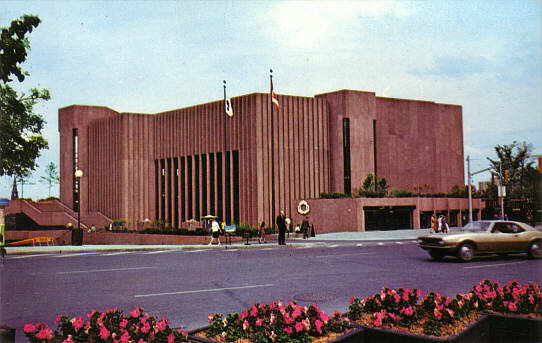 Opened 2 June 1969. The complex comprises three halls, a restaurant and several bars. Southam Hall: Organ by Flentrop. Curtain by Micheline Beauchemin. Used for opera, ballet, and musical performances, movie screenings, and classical and pop concerts. 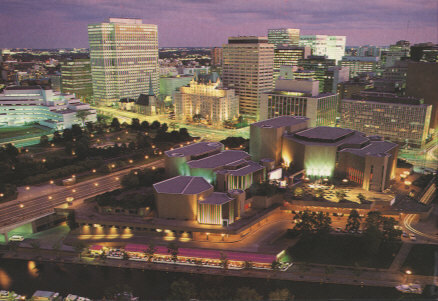 Home to the National Arts Centre Orchestra and the Canada Dance Festival. 2325 seats. 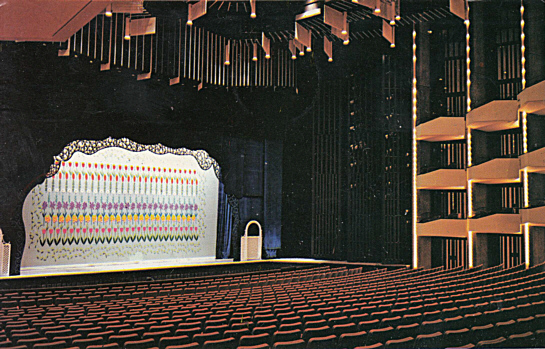 Theatre Hall: Used for English and French drama performances, smaller musicals, and corporate presentations. 969 seats. Studio Hall: Used for all kinds of performances and corporate presentations. Up to 300 seats. Reverse Text: "National Arts Centre, Confederation Square - Centre National des Arts, Place de la Confederation - Ottawa, Ontario, Canada"
Reverse Text: "National Arts Centre, Showcase of the performing arts in Canada. 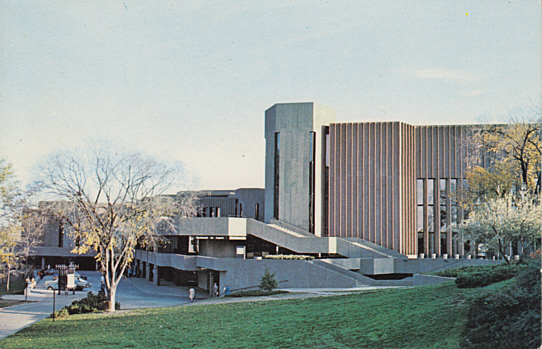 Home of the NAC Orchestra. Houses an opera house, theatre, experimental theatre, salon and restaurant. Le Centre National des Arts. Orgueil du Canada, le CNA possède un orchestre réputé. Il contient des salles d'opéra, de théâtre et de théâtre experimental, ainsi qu'un salon superbe et un restaurant." Reverse Text: "National Arts Centre. Ottawa, Canada. 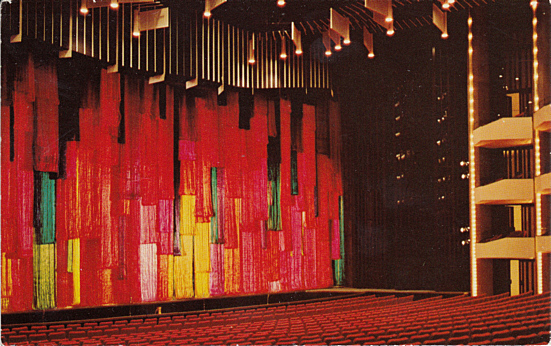 The 2,300-seat Opera House of the national Arts Centre, with ceiling designed by Julien Hébert, and its glittering curtain by Micheline Beauchemin, developed in conjunction with Kawashima Mills of Kyoto, Japan. - Centre National des Arts. Ottawa, Canada. La salle de l'Opéra du Centre national des Arts. Le plafond est une création de Julien Hébert, et le rideau réalisé par Micheline Beauchemin en collaboration avec la masion japonaise Kawashima de Kyoto." Reverse Text: "The Opera. Le Opéra. National Arts Centre. Centre National Des Arts. Ottawa, Ontario, Canada." Front Text: "National Arts Centre, Ottawa, Canada"
Reverse Text: "Evening View across the Rideau Canal - Built in the centre of the nation's capital to commemorate Canada's 100th birthday in 1967, this beautiful $47 million Centennial project consists of an Opera House, a theatre, and a studio theatre, as well as many interesting shops and dining areas. Pride of a dynamic nation, its main purpose is to sponsor the growth of Canadian arts." 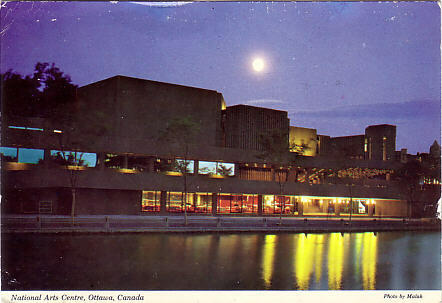 Front Text: "National Arts Centre, Ottawa, Ontario, Canada"
Reverse Text: "Ottawa, Ontario, Canada. National Arts Centre - Confederation Square. Centre National des Arts - Place de la Confederation"
Reverse Text: "Ottawa, Ontario. The National Arts Centre in the foreground, alongside Rideau Canal. The Parliament Buildings with the Ottawa Ricer in background, the City of Hull, Quebec, beyond. - Ottawa, Ontario. Le Centre National des Arts au premier plan, le long du canal Rideau. 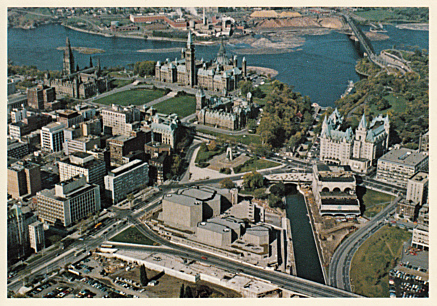 Les édifices to Parlement et la rivière Ottawa à l'arrière plan; plus loin, la ville de Hull, Québec." 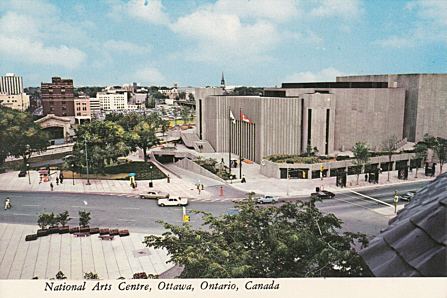 Reverse Text: "National Arts Centre - Ottawa, Ontario - Centre National des Arts"